Inspired by Simple Sparrow’s idea, I have signed up for the Use What You Have Month. Things have started to pile up in the workroom (now that it exists), and anyways my funds are limited until I get another job, so this seems like a good plan for the next few weeks. I’m including all craft in this – knitting, sewing, and making in general. I have been promising to myself that I will get more experience of colour work, (last year it was lace, this year it’s colour). This project is a perfect way to start. Later in the year I’m planning to knit the Deep Argyle Vest, and the argyle jumper in Handknit Holidays. Mind you there will also be shawls (maybe in May once my stash-fast is over) and lace socks. I am so impressed with the idea of using what you have. I think that is great! I am trying my hardest not to purchase any new yarn or fabric, but I keep finding myself in need of notions to finish up little projects here and there. This weekend it was pom poms, zippers and a new spool of thread. But I put the fabric back on the shelf! Little victories. Your socks are lovely. Yay for crafting! 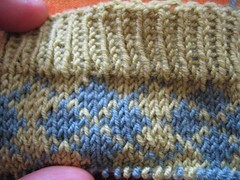 I love the argyle…I can’t wait to see what they look like once you get a few more pattern repeats in! I too am coveting the Deep Argyle Vest.